Q. Is my roof suitable for a solar power system? For a fixed array on the Sunshine Coast Queensland, the array should face True North and be tilted close to latitude for best year round performance. Tilt less than latitude gives better summer performance, tilt greater than latitude gives better winter performance, 15 to 30 degrees of tilt performs quite well here on the Sunshine coast. Average yearly performance is still quite good with orientations NE or NW, and tilt should always be greater than 10 degrees to ensure adequate self cleaning of the modules occurs with rain. Arrays on Roofs with a pitch greater than 35 degrees become difficult to install and performance decreases considerably when tilt exceeds 50 deg (for Sunshine Coast QLD). Shading decreases performance and should be avoided, particularly between 8am and 4pm when solar radiation is at its peak. Our site analysis (for Sunshine Coast customers only) will take into account the orientation / tilt and existing shading objects, to calculate system performance for each month of the year. Cost Savings are then extrapolated from these performance figures. A 1kW PV array requires a minimum roof area of 5.2m x 1.6m, or 2.7m x 3.2m. Other array configurations are possible where space is limited. If you have an asbestos roof, you will need to have it replaced before we will install any equipment on it. Your roof and substructure must be in good condition such that it will last the life of the PV system (approx 25 years). Q. What cost savings can I expect from a solar power system? This will depend on whether you are connected under the now discontinued $0.44/kWh NET feed in tariff, or the new $0.06 / kWh NET feed in tariff. Where you are using more power than you are generating, you make cost savings at the rate you pay for electricity ($0.26 / kWh depending on tariff / retailer). Note – a site specific shading assessment is required in most situations to give a realistic idea of cost savings. your electricity retailer pays you $0.44 / kWh for excess power that you feed to the grid, cost savings are largely dependent on your own daytime electricity use between 8am & 4pm, as well as the output of your system. An Annual saving of around $790 / year is achievable for a 1.7kW system on the Sunshine Coast with optimal orientation / tilt & NIL shading, when your daytime usage between 8am and 4pm is 3kWh. An Annual saving of around $2400 / year is achievable for a 4.2kW system on the Sunshine Coast with optimal orientation / tilt & NIL shading, when your daytime usage between 8am and 4pm is 3kWh. your electricity retailer pays you $0.06 / kWh for excess power that you feed to the grid, cost savings are largely dependent on your own daytime electricity use between 8am & 4pm, as well as the output of your system. Where you are using more power than you are generating, you make cost savings at the rate you pay for electricity (e.g. 27c / kWh). This means that scheduling energy hungry appliance use during peak sun times is more beneficial in this case. The days of oversizing a PV system to get a better payback period are over. Refer to our Solar Bonus Cost Savings Page to understand how cost savings are made under a NET feed in tariff. Q. How much does a solar power system cost? Cost will depend on the size / complexity of the installation and the value of REC’s (Renewable Energy Certificates). Our RECs page gives details of the “Solar Credits Scheme” which allows additional REC’s to be created for new eligible systems. Q. What sized system has the fastest payback time? Payback times are affected by your “daytime electricity usage”, your PV system’s output and the system cost. Under the old Under the $0.44 /kWh NET feed in tariff (in QLD) you only get payed a higher rate ($0.44 / kWh) for electricity fed to the grid which is in excess of your own power requirement. Until you overcome your own power usage, cost savings under a NET feed in tariff are only made at the rate you pay for electricity (e.g. $0.27 / kWh). Therefore, payback time will be dependent on both your “daytime electricity usage” and the size (or more importantly) the output of your solar generator. After we do a site analysis we give advice for payback times based on your actual site conditions. At $0.44 / kWh feed in tariff, larger systems have better payback times, unless you use very little power during the daytime. At $0.06 kWh feed in tariff, a system that feeds the majority of its generated power to the grid will have a longer payback period. A Photovoltaic Array converts the Sun’s energy into Direct Current (DC) electricity. An inverter converts this DC electricity into Alternating Current (AC) electricity and feeds this AC electricity into the grid via your switchboard. Grid Connected Solar Electricity does not replace your main grid power which remains connected giving the advantage of being able to use large appliances when required. Grid Connected Solar Electricity does supplement your power requirements and will feed any excess power into the grid when you generate more power than you use at any instant. Q. What happens when the Grid Power fails? In the event of a Grid Power Failure, the inverter will automatically turn off to ensure that electricity is not being fed into an unsafe situation (e.g. power lines down). This is called anti-islanding protection and is a requirement of the Australian Standard AS4777 to ensure the safety of the network to which the inverter is connected. In order to maintain electricity supply during a blackout, you would require a system with an integrated UPS (Uninterrupted Power Supply). Hybrid systems (grid connect with battery) such as the Selectronic SP Pro, have an integrated 63A transfer switch and in most domestic situations are able to supply your entire house during a blackout. 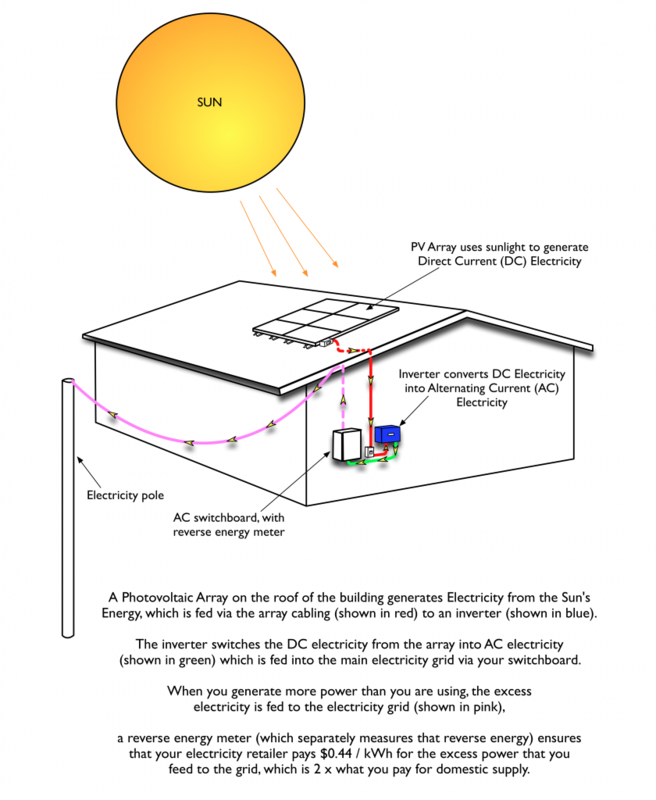 Unlike off grid solar systems, normal Grid Connected Solar Electricity does not have a battery bank to maintain, and maintenance is therefore very easy. Where the panels have sufficient tilt and rain, they will self clean and typically only require inspection to ensure they are not damaged. Occasionally you may need to hose off dirt / dust when there has been insufficient rain, and clean bird droppings off the panels. The inverter is almost maintenance free, but should be checked every now and then to ensure that animals / insects are not making it their new home. Maintenance programs can be tailored to suit the customer and we can ensure that your system is operating correctly at it’s optimum. We are a local Electrical Contractor, who offer rapid service in the event of any breakdown, and our workmanship is covered by a 5 year Warranty. Off-grid or Hybrid system’s will require more maintenance depending on the products used (battery / generator etc), however new battery technologies are much improved offering much lower maintenance than the wet/vented cells of old. Further, most new equipment offers system monitoring which will advise of most problems as soon as they occur. Make sure that the designer and installer are Clean Energy Council (CEC) accredited. For grid connect systems it is advisable that the installing electrician has CEC grid connect, design / install (D&I) accreditation to ensure that he / she is aware of all relevant standards. Ensure that the components in the system are from a reliable source so that you don’t run into problems should a warranty situation ever arise. All solar panels and inverters that are approved for rebates are published in a list available on the CEC web page on the following link. View the Clean Energy Council’s Consumer Guide to Purchasing PV Solar. When comparing quotes, ensure that you compare the quality of the components,design and installation. Does your installer measure shading and roof orientation in order to calculate outputs according to the actual site conditions ? – keep in mind that if the designer does not calculate outputs according to the actual site conditions, or take into account technical derating factors, their system probably won’t produce their expected power. Before giving you a quote – Any installer who is following the CEC guidelines is supposed to inspect the site to measure any shading objects, measure roof orientation and work out OHS requirements along with other physical job requirements. If you receive a quote that does not include predicted outputs (based on actual site conditions), predicted cost savings (at existing electricity cost), a firm quotation including all equipment and installation charges, full specifications of the system (including make / model and quantity of modules and inverter), and warranty information for these components, you should make a complaint to the Clean Energy Council – there are strict guidelines that CEC installers are supposed to abide by. The following link shows the Clean Energy Council’s Grid Connect Design Guidelines – see for yourself if your installer is following the guidelines. Ensure that panels are mounted on racking that allows adequate cooling of the panels and allows leaves to blow through underneath the panels, rather than build up which may cause a fire hazard. Racking (mounting systems) should have wind loads calculated for the specific site and installation conditions – Does your installer calculate wind loading according to the site conditions ? Many PV modules are not rated to withstand the wind pressures that occur on tilted arrays, whilst the calculations for wind loads are reasonably time consuming, you have to ask yourself whether you would you prefer a cheap job, using cheap components that doesn’t consider wind loads ? – these sorts of problems are not likely to be covered by warranty. Beware of unscrupulous companies who send misleading advertising or ads saying last day sale, complaints regarding the use of pressure tactics and misleading ads should be directed the office of fair trading. Make sure that you read the fine print before you assign REC’s to anybody. The following link shows the current REC price. There are many cheap installations being done by others who are rushing to do the quickest job possible because they are being payed a minimal flat rate per job by the “Company” who has offered you a “great deal”. With expected life spans of around 25 years, would you compromise your installation to be done by a rushed install team using the cheapest components available? Grid Connected PV systems typically have large DC Voltages capable of sustaining long arcs (ionised air), small things like the quality of the cables, terminations (including workmanship) and switch gear can seriously affect safety. Many of these cheap components when subjected to 25 years of heat and weathering may prove to cost you far more in the long run. Does your installer perform proper commissioning testing ?